The different advancements in technology especially the use of the Internet has introduced new concepts, styles and techniques in the world of art especially in terms of design. The use of advanced tools like Photoshop and Illustrator have unleashed the maximum potential of every artist in creating designs. While some are creating new techniques, some artists are combining old styles with modern tools to come up with a unique feel in the whole design concept. One such technique is combining the retro and vintage style with modern methods to create a new and distinct design idea. 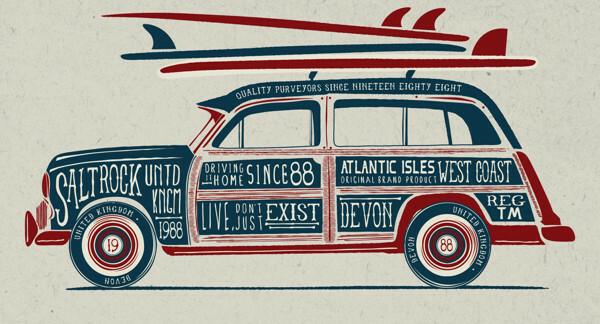 One amazing artist who has maximized the use of the vintage style in modern designs is Neil Beech. The UK-based freelance graphic designer and illustrator has used this style in most of his graphic works like logos, type, labels, packaging, shirt designs and more. His works are characterized by the use of classic typography, grunge textures and retro themes. Lets take a look at some of Neil’s cool vintage graphics below and be inspired how a classic theme can still be a great option for your design concepts. Have you ever tried incorporating the retro and vintage style in your designs? Tell us your thoughts as well as your suggestions by commenting below. Stay awesome everyone!